Here I go again. Shamelessly stealing from Sean. Well, it’s not stealing if he says I can, right? And if I give him full credit? I love this man. He says it the way it should be said. He is not ashamed of his Southern roots. He is not ashamed to eat real food. And to write about it. Over the years, I have battled with my roots. And I am not talking about my hair. (I gave up coloring it a year or so ago, so I don’t have to worry about those roots anymore anyway.) I am not and never have been ashamed of where I come from, but I have not always been totally forthcoming about it. I grew up thinking that everyone but me had the perfect family. I now know that no such thing exists — except maybe on TV. Anyone out there remember Leave it to Beaver? We all have some crazy in our backgrounds. But, as I have come to understand, most people do the best they can on a daily basis. Some are not as adventurous or ambitious as others. That’s okay. Some don’t need to leave their zip code. That’s okay. Some work with their hands. Thank God. Some go to school for many years so that they can heal us and help us get out of trouble. Thank God for that, too. Some hold hard and fast to their religious beliefs. That’s not bad. At least as long as they allow others to do the same. I am constantly amazed that some Americans seem not to have heard of separation of Church and State. Or that some politicians simply ignore this in order to get more votes or to appeal to certain voters. I was terrified of my 4th grade teacher. Every Monday morning, she asked for a show of hands of her little 9-10 year olds who went to church the day before. I was so embarrassed that I lied and raised my hand whether I had gone to church or not. She should not have asked that question. Times have changed, thank goodness. Well, in some places they have. Don’t get me wrong. I have absolutely nothing against religion or religious people. Mama Mildred would disown me. However, religion is a personal choice. I am much more concerned with how we as humans treat each other on a daily basis. On my maternal side, I come from some hard-core Baptists, Southern and otherwise. On the paternal side, I am the descendant of Methodists and Quakers. Wow. I got off track there, didn’t I? Anyway, back to Sean and his lovely Facebook post from today. I read his posts first thing- well, after getting the coffee going and feeding the cat. I laugh, I cry, I always find a little nugget in what he writes that I can identify with. He uses the English language in a way that makes me happy. He paints pictures with his words. He loves and he is not afraid to say it out loud for the whole world to hear. Bless his heart, as we say in the South. And I mean that in the best possible way. Enjoy. It took me a few hours to understand that. By then, I’d finished the cookies. Well, heaven bless the good woman who does not walk in the path of the unrighteous, nor practice the spiritual defamation of plastic-tubed biscuits and frozen breakfast burritos. I’d like the record to show that I miss the days of real food . I miss country ham—the kind that comes from a hog in a nearby county. And real fried chicken—made with an iron skillet and slippery floor. Last Christmas, a friend served ham from Walmart. It was an affront to decency. The meal tasted like undercooked linoleum. The package label on the ham read: China. I’d rather eat chicken feet than red ham. I miss grits that come from feed-sacks, that take more than two minutes to prepare. I miss French fries cut before frying. I miss popcorn made in a skillet, with enough butter to short circuit U.S. Congress. A friend made microwave popcorn during a football game last weekend. When it finished popping, he opened a yellow packet of slime, labeled, “butter-flavored topping.” That gold-colored degradation ruined my favorite shirt. What happened to real butter? The kind that made your arm muscles sore. Or ice cream that turned into soup if you didn’t eat it quick. Commercial ice cream wouldn’t melt on my dashboard. I miss how it was before people worried about deadly mosquito bites, dookie in our drinking water, whole milk, and deer ticks. As a boy, deer ticks were no cause for national alarm. Now they’ll turn your brain into butter-flavored industrial pump lubricant. I met a man who went fishing with his nine-year-old son. While on shore, he saw a deputy in a khaki uniform. My pal knew something was wrong. The deputy inspected the fish his son caught, then asked to see fishing licenses. My friend, like any self-respecting Southerner, did not have a license, nor has he ever. Johnny Policeman fined him. His son had to throw his fish back. And the deputy called his mama ugly. I don’t know how to get things back to the way they were—back when a grit was a grit. But, I wish it could be done. God help me, I do. Not because I’m not happy, but because the world doesn’t seem happy. Thanks for these sugar cookies, ma’am. And God bless the good woman who wears a one-piece. 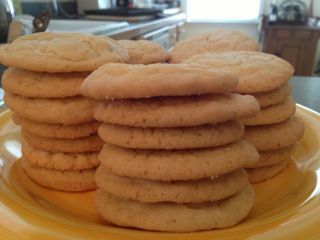 Now doesn’t that post just make you want to eat some sugar cookies yourself? Well, I have the perfect recipe. I love these things. Could eat my weight in them. I have several recipes. A Quaker one even. But I will share these two. I actually did a taste test a while back. We will begin with Sistine Chapel. 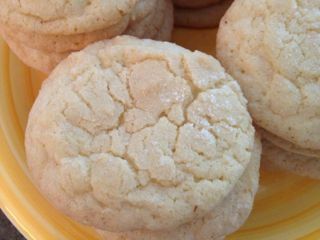 Using a mixer with the paddle attachment, cream the sugar, butter, and Crisco until light and fluffy, about 2 minutes. Beat in the eggs, one at a time, mixing well after each addition. Add the vanilla, lemon extract, and orange extract. Mix well. In a separate bowl, stir together the flour, baking soda, and cream of tartar. With mixer set to low, gradually add the dry ingredients to the wet ingredients. For each cookie, drop 2 Tbsp. 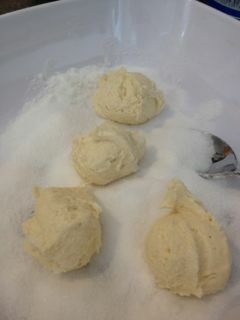 of dough (I use a melon baller/scoop for mine) into a bowl of sugar and roll the ball to coat. Place on a greased cookie sheet (I line mine with parchment paper and skip the greasing). Before baking, sprinkle about 1 tsp. of sugar on top of each ball to cause crackled top. Bake 14-17 minutes or until edges are light brown. (My guys do not like “well done” cookies so I set the timer to 12 minutes and they were just right.) Remove from baking sheet to cool on wire racks. Adjust oven rack to middle position and heat oven to 350˚F. Line 2 large, rimmed baking sheets with parchment paper. Whisk flour, baking soda, baking powder, and salt together in medium bowl. Set aside. Place 1 1/2 c. sugar and cream cheese in large bowl. Place remaining 1/3 c. sugar in shallow dish or pie plate and set aside. Pour warm butter over sugar and cream cheese and whisk to combine (some small lumps of cream cheese will remain but will smooth out later). Whisk in oil until incorporated. Add egg, milk, and vanilla. Continue to whisk until smooth. Add flour mixture and mix with rubber spatula until soft homogeneous dough forms. Divide dough into 24 equal pieces, about 2 Tbsp. each (or use #40 portion scoop). Using hands, roll dough into balls. 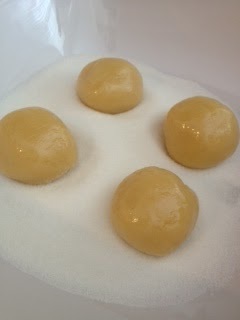 Working in batches, roll balls in reserved sugar to coat and evenly space on prepared baking sheet, 12 balls per sheet. 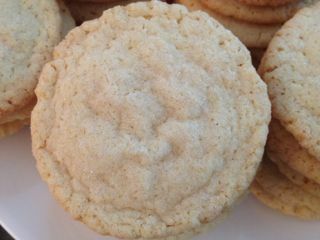 (Spread them out even if you have to use an extra sheet so that they have room to bake– they do spread out when baking.) Using bottom of a drinking glass, flatten dough balls until 2 inches in diameter. Sprinkle tops evenly with the remaining sugar. Bake, 1 tray at a time, until edges are set and just beginning to brown, 11-13 minutes, rotating tray after 7 minutes. 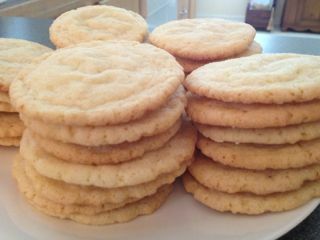 Cool cookies on baking sheets about 5 minutes. Transfer cookies to wire rack to cool. Bon appétit and Happy Monday! Eat more cookies– good ones! Otherwise, why bother? Life is too short.